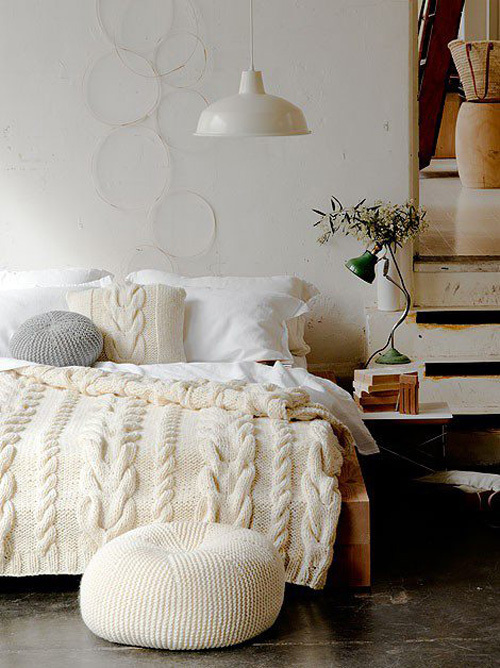 Today I’m loving … this cosy bedroom. Update: the beautiful hand knitted throw/bedspread and the hand knitted cushion featured in the image above are available from Le Souk. Completely cosy! I want to make an ottoman just like that after the holidays…. Just need to find the right yarn. I wonder when we are going to see a pattern for making these marvellous pouffes? I LOVE this! Amazing! I just did a post on my facebook page today … i like it soo much. It is very comfortable and warm. I’d like to have this kind of bed.. The cable on the throw looks so soft and thick, it must be so cosy. Also, the texture of the knits makes the room so interesting and homely yet there is hardly any colour in the room. Clever. I wondered where I can get this cable knit blanket/throw? Thanks! Thanks for the link, Maria! Now to find the time to make it!